B2B Blogging: What are You Talking About? The other day I ran across a neat tool that generates a word cloud for a blog. This is different than a tag cloud. A tag cloud is a cloud of words based on how you’ve tagged your blog posts. As such, you obviously influence the cloud based on how you tag your posts. The word cloud, however, looks at the text of your blog posts. The image above is a word cloud. When I looked the word cloud for our b2b marketing blog, I thought it reflected our subject matter and the intent of our posts. We focus strictly on B2B. We specialize in the development of B2B content marketing assets as a primary way to convey and support key messages and establish thought leadership in a client’s given niche. We help B2B clients effectively use social media, search engine optimization, and email marketing to promote these content marketing assets, and generate and nurture leads until they are sales ready. Okay. Given what we focus on, we’re doing pretty well, I said. 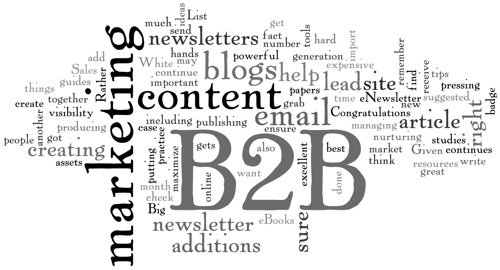 Some of the related key words really stand out in the word cloud—like B2B, content, and marketing. Some of the content vehicles have visual prominence, like blogs, email, newsletters, site, and article. And the word “lead” pops out a bit. But there were some words that were far less prominent or even absent, like optimize, search, SEO, social, and thought leadership. I was a bit puzzled by that. Those are things I thought we were definitely talking about and focusing on. When I went back to recent posts, I found that in some cases we cover these issues in posts, but we don’t actually end up using the words as prevalently as I thought. In other cases, it had been a while since we posted about certain issues and topics. Finally, I found that all of our posts and articles tend to run together in my mind; while I’ve written several articles recently on blogging and thought leadership, the ones discussing thought leadership were articles published elsewhere, not on our blog. This has implications for both visitors and search engines. For visitors, we may be talking about and around the issues, but unless we’re clearly using the words that resonate with visitors, they might not connect the dots (issues, implications, concepts) in the same way we do. The key words we use give readers context within which to evaluate or consider the subject matter. Make sure you’re using familiar words that give your readers context of the issues. These words serve as touchpoints and help position your content. Secondly, it’s smart to do an audit of your blog posts. What is the subject-matter allocation of your blog content, and how recent are the posts in each category? Don’t just look at the category or tag of the posts, but remember to look at the copy of each post. Doing an audit will also help you sort out what you published on your blog and what content was published elsewhere. Finally, while there are many factors that influence how well a blog post is optimized for search, the copy you use in the post an important factor. Make sure your posts are sufficiently keyword rich. This doesn’t mean you should be keyword spamming. However, you should make sure you’re actually sufficiently using the keywords for which you want to be found. As a test, I created word clouds for a couple of blogs I follow. Some were spot on, totally aligned with my impressions of the blog’s focus. Other word clouds left me guessing as to the intent and the content of the blog. If you simply showed me the word cloud, I could not have told you with certainty what the blog was about. I know the word cloud is a far stretch from a complete analysis of a blog or its content. It’s simply a fun tool. But it gives you some insights into how others might view your content and your focus. Just one note: If you try to generate a word cloud from a blog feed that shows only the introductions to posts, you’ll obviously get different results than if you point it at a full feed. So what about your blog? What does your word cloud look like? Is it aligned with what you think you’re talking about? If you’re curious, you can go to Wordle to find out. Let me know what you think. Did your word cloud align with your mental image of your blog? Galen, Thanks for such a visual example of your point about blogging content and for findng that wordie tool. I can’t wait to try it out on my blog. 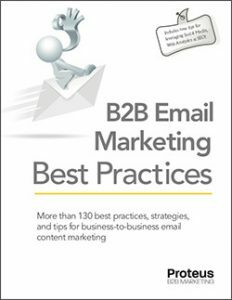 I’m posting a new article tomorrow that mentions you as one of the B2B Marketing “braniacs & maniacs” I follow on twitter. As ususal you are always sharing great ideas. Now that almost every kind of marketing content can be optimized for search without overly contriving the message, it’s probably not a bad idea to try that wordie tool on any body of text on everything from from emails to press releases. There are other types of “graders” but that simple visual device paints a clear picture at a glance. Thanks for the comment and the compliment, Billy. I think the tool offers a good reminder to step back periodically and assess the messages of marketers’ content and where that content appears. The quick visual snapshot didn’t provide answers right away, but it made me ask some good questions and investigate further. In using a quick and simple tool like this, it’s important to look at what’s present in the cloud, but perhaps more importantly, what’s not present. The thing that really stood out for me was the realization that certain subjects and content created by us was being published on other sites like Search Engine Land, MarketingProfs, etc. While that’s a good thing and part of our overall marketing, we weren’t doing as good of a job in making sure those matters received appropriate weighting on our blogs.